this ebook may rescue your business. I started studying development in 2002 and user-centered design in 2006. Now I'm writing "the book" on digital strategy for developers. But there's no reason to wait for it to come out. 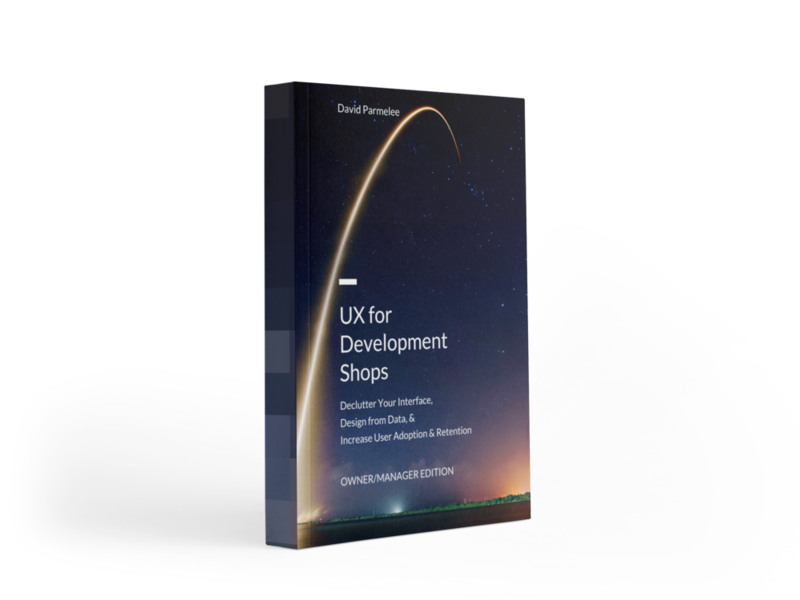 These free, advance chapters show you how to improve your product using what you’re already doing as a developer. Get your free chapters in your inbox today. You thought you'd built what they wanted. You built a website, app, or software product to spec, and you're good about handling realistic feature requests. But your users still abandon it or won’t pay for it. Involving other people in your company just made your product look like a committee designed it. Hiring a designer left you with ideas that were very difficult to implement. A redesign doesn’t guarantee success. Doing the design yourself just left you staring at a blank screen. Updating your UI libraries brought your design up to date, but your product remained confusing. Start fixing this in your next major release. You can have a system that gives you products that people will pay for and keep using. You can build products that people want - even if you can’t go talk to those people. You can create UIs with more confidence, whether you design yourself or hire a designer. First impressions: Users aren't one big group. In this example, I describe how 4 people will have different impressions and needs from the same product. "Slap a UI on it": Creating a great technical solution and adding a UI as an afterthought later costs a lot more than you think. The difficulty of good UI design: Your product lives within something much larger. If you outsource UI work and call it "easy", your team will miss that. Meanings of "intuitive": This word shows up a lot in UI design discussions. But it takes on different meanings to you and your users. The dangers of "the user": "The user" falls short in many ways. Beat opinion-driven design with a subtle shift in language. Effective backstage work: Many developers spend most of their time on features that users never see. That doesn't mean that you can't use that work to build good habits. Great design in the world around you: It goes farther back than you think. The hacks that make development easier: You can apply what you're already doing in your dev job to improve your users' experience with your product. Happy users vs. good products: It's great when users are happy! Here's how you can build momentum off of that to keep growing your product and business. Great design for enterprise products: No, being "the best among your competitors" isn't good enough. Here's why - and how to beat that. Remote-friendly problem solving: Most developers don't get to see their users in the field. Fortunately, you can learn a lot about them from your desk. Get a draft of 2 free chapters now and 30% off the whole ebook when it’s released on October 4, 2017.